The Manatee is the new signature yo-yo for CLYW Team Member Riccardo Fraolini. It has a super wide profile with a huge catch zone for all those tricky catches, and plenty of rim weight to help you get through those long tricks and combos. 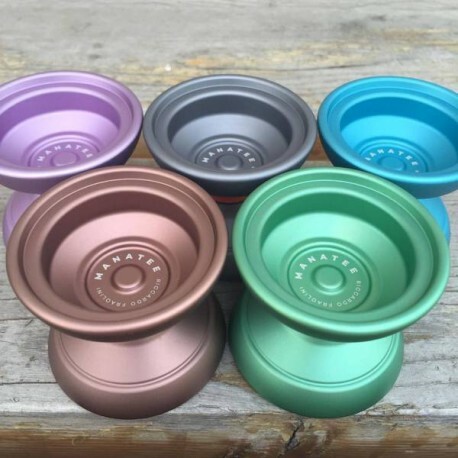 It's also the lowest priced metal throw that CLYW have made to date! For more information on this fantastic throw - check below! Riccardo has made a name for himself as the undisputed king of the #trickcircle, posting some of the most mind-blowing original tricks imaginable to his Instagram and Facebook accounts, and he wanted a yo-yo that would make his nearly-impossible tricks just a little more consistent. The Manatee design started with the Arctic Circle 2; Riccardo wanted a similar feel look with;the rims, but asked for a different feel on the string. The Manatee's weight distribution makes it really easy to control the speed of your play, whether you are slowing down a trick for video or pushing for ultra-fast contest play. On top of all this - it's one of the lowest priced CLYW throws on the market. So this is an amazing opportunity for players to pick up a high quality CLYW throw with out having to pay the premium price tag. Check out the awesome promotional video of the Manatee below!